Looks can be deceiving where pomegranates are concerned. Pomegranates don’t necessarily have to be bright red, but they should feel heavy for their size and look full and round rather than somewhat drawn in or dried out. Gaining Super Fruit status is pretty special, and it’s the antioxidant properties in pomegranates that make such pronouncements applicable. Pomegranates are indeed a powerhouse of polyphenolic antioxidant compounds like punicalagin, ellagitannins, catechins, gallocatechins, and anthocyanins. These antioxidants search for unstable molecules in our body's known as free radicals and then they neutralize them. Science has shown free radicals to be harmful and the consumption of naturally rich antioxidant fruit like pomegranates my help boost your body's natural ability to fight free radical damage. 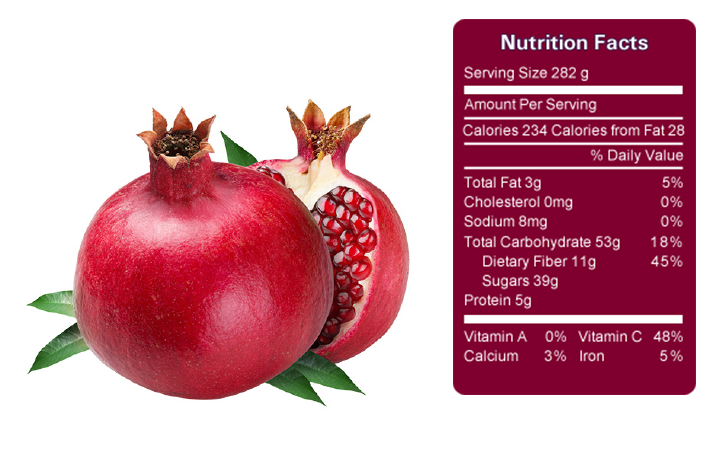 Pomegranates are also high in vitamin C, K, and a good source of B5, potassium, manganese, phosphorus, and dietary fiber.